Can Whales And Humans Collaborate On Research? : 13.7: Cosmos And Culture Scientists are divided over whether swimming with, and studying the communication of, free-ranging whales through free diving is good science, following good ethics, says Barbara J. King. Can Whales And Humans Collaborate On Research? Nestor has joined the DareWin Project in which free-divers enter the ocean to observe sperm whales and record their clicks — echolocation sounds and coda clicks that allow these mammals to investigate their world and talk to each other. In free diving, people enter the water with no equipment — and stay submerged for three to five minutes on the strength of one breath. "...believe that sonar artifacts (like images) might be embedded in these vocalizations — that because these animals are already viewing their world through echoes, they may also be able to send these echoed images to one another. They'll test the theory by capturing these clicks, sending them back to the animals, and seeing if they repeat them. Next, the researchers will create artificial clicks containing three-dimensional sonographic images of things in our world — a tree, a human — and send these as well, prompting, perhaps, a kind of dialogue." My immediate response was unease. Last year, I interviewed Hal Whitehead of Dalhousie University and Luke Rendell of the University of St. Andrews about whale and dolphin culture, and I knew that they had spent decades together and separately studying, in incredibly productive ways, sperm whales from boats. Isn't it poor science, and also a disturbance (however quietly conducted) to the whales, to drop down into their habitat for little bursts of observation like free-divers do? I asked Whitehead and Rendell — and two other scientists I've also spoken with before, Lori Marino of the Kimmela Center for Animal Advocacy and Carl Safina of the Safina Center at Stony Brook University — for their thoughts. 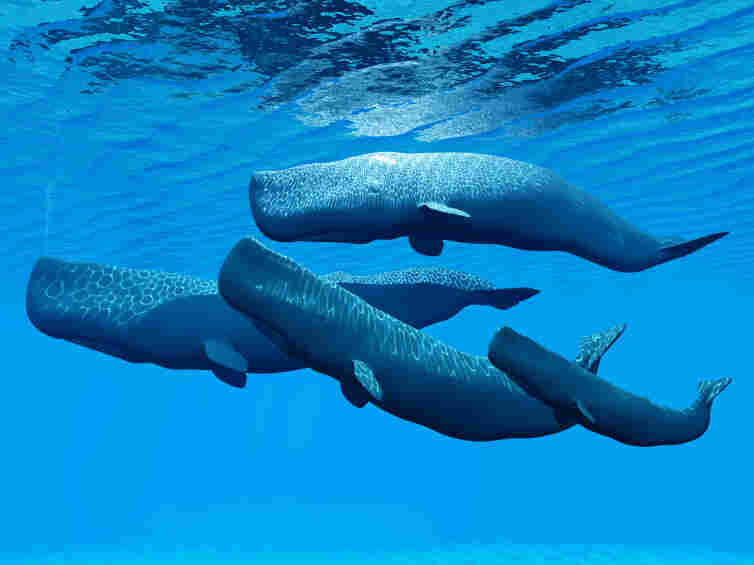 "In my 35 years studying sperm whales, I have tried to get something of a feel for what a sperm whale is. To do this, we try to watch and listen to them behaving naturally, so as hands-off as possible. We can identify who says what to whom, and how this relates to their social relationships as well as their kinship, doing this over intimate scales of family units, as well as across ocean basins. In the early years we tried swimming with the whales. It was really fun, but we got virtually no useful scientific information and it disturbed the whales, so I have not swum with sperm whales for the last 20 years. With this perspective, the DareWin project looks pretty dubious, both scientifically and ethically." Rendell agrees. "The reason we don't go in the water is that we know that the moment we do, the whale's behavior is altered, making interpretation of observations problematic," he says. These words from experienced scientists carry weight. Yet then I wondered, couldn't the same criticism be leveled at Jane Goodall, for following chimpanzees in Tanzania — or at any scientist in the field who closely approaches the animals? "As Toni Frohoff and I have written, we are calling for a shift from research with captive animals to collaborative research with wild animals. Not only is it ethically more defensible to place oneself in the other animal's natural environment instead of taking them from their home, but it has greater external validity. In captivity you may find out what a whale CAN do but in the wild you can find out what he or she DOES do. So, as long as the researchers aren't harassing the whales, I see little to be concerned about ethically." "I think the team assembled, as described in the article, is capable of doing good science. I have zero difficulty with the ethics. On a related note, I don't think it's good ethics to exile ourselves from all interactions with free-living animals, because they crucially need us to know them better." I was, though, struck by an article that Rendell pointed me to, published by Nestor in Outside magazine in 2014. "In this article," Rendell noted, "they go to Sri Lanka because researching sperm whales in these waters was easy — there are no permits required, no authorities to evade." One important point was shared from both sides: We can't properly evaluate the free-dive approach to whale communication until the data appear in peer reviewed articles. And here's Marino: "It isn't enough to just put it on a website or in a popular article without first having a hearing among one's peers." "From other work we know that it might be possible that sonar-using cetaceans and bats might not just use sonar to hear but to actually see. Imagine that a certain set of clicks shows the whales that a tasty giant squid is nearby. Could they re-send a replica of those returned clicks to other whales, letting them get the same image, while they understand that another whale is sending those sounds? They might not even need to, because other whales can eavesdrop on each other's sonar, hearing the clicks the whales are making and also the returning echoes. An imperfect analogy is that if you're playing a musical instrument you can hear it, and so can everyone around you. So it's interesting." On one thing, all parties agree: These whales are "extraordinarily intelligent, fully conscious beings," to use Nestor's words. In the end, I'm not totally free of concerns about this free-diving project. But the idea of collaborative research with wild animals — when done ethically — is extremely exciting.